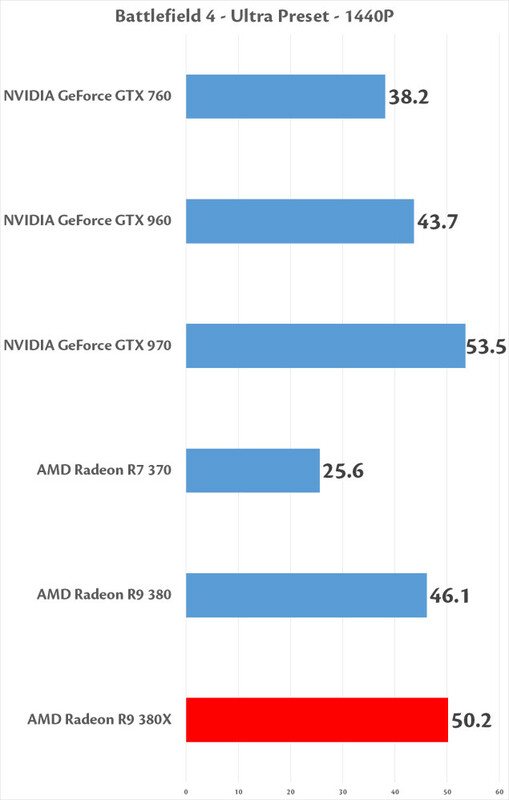 And to the heart of the matter, the performance of the 380X when compared to its closest rivals. 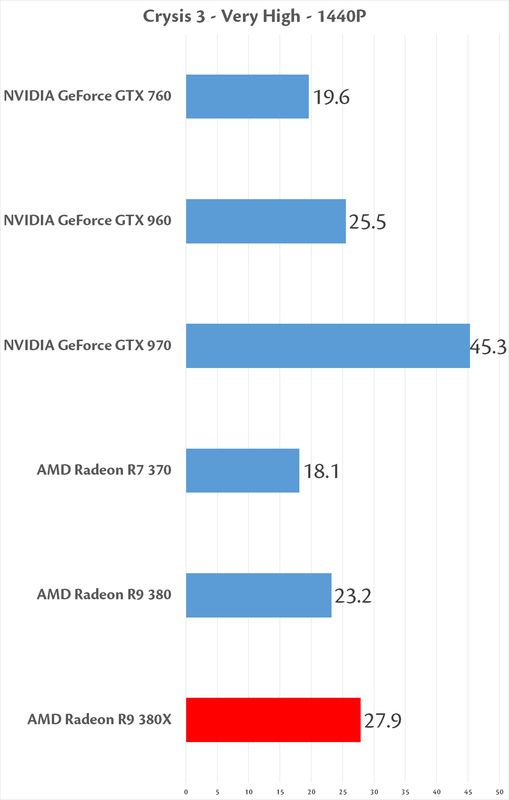 The 380X being positioned where it is makes for an interesting proposition, because it may, or may not, actually out perform even it’s closest in-house rival by a margin that that makes the slightly larger price worthwhile. But let’s take a look. The Frostbite engine has come a long way in the many years of its development. Even though it was released in 2013, it provides great insight into the capabilities of the modern GPU. DICE has done a great job making it look fantastic while generally running well on any number of GPU’s It’s still quite the challenge for even the most potent, however. It’s no surprise that compared to the 960 that the 380X is able to do very well. Even at Ultra settings with a lot of action happening on the screen, the framerate is averaging very high and is running very smoothly. 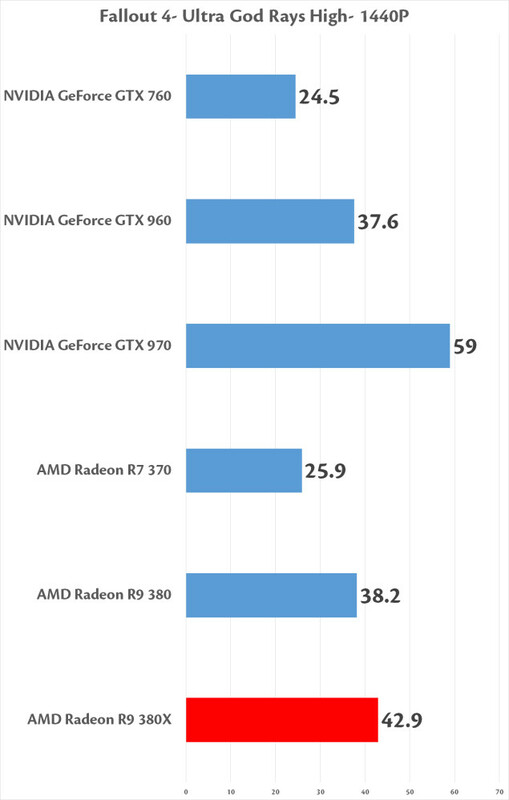 Surprisingly, the 380X is very close in performance to the 970, which is a price bracket just above. It keeps pace quite well in Battlefield 4. Full Tonga is looking to be well suited to the desktop space already. Battlefront is a necessary evolution of the Frostbite 3 engine. It isn’t revolutionary by any means, but the increased texture resolution combined with better use of lighting and shadows, as well as a drastic increase in complexity of the scenes in all the maps, make for a challenging benchmark. Being Frostbite 3, it’s also very well optimized and runs well on everything, making it a great candidate for a benchmark. Star Wars Battlefront is a bit more demanding than Battlefield 4. The Endor level itself is lush with vegetation, wildlife, Ewoks and plenty of explosions and other lighting effects that can make for a much more demanding scene. 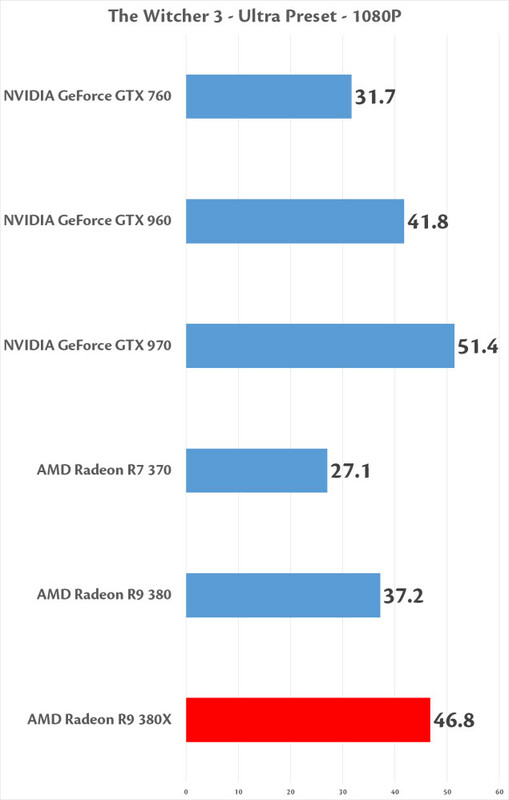 Overall it seems that the 380X leads its direct competitors, though only slightly in this case. Crysis 3 is still one of the best looking games around. 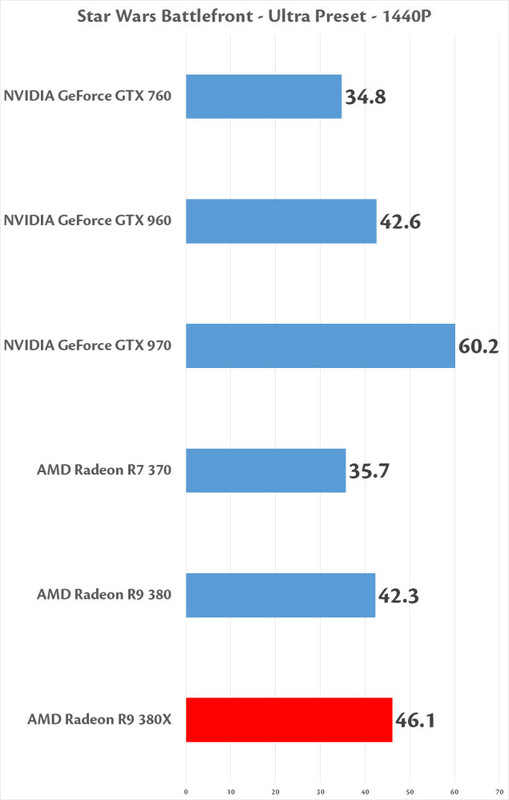 It’s a challenge for any video card and almost the standard for which we jokingly ask if something is powerful enough. The CryEngine is a very advanced engine and brings most GPU’s to it’s knees when everything is turned on, such as here. 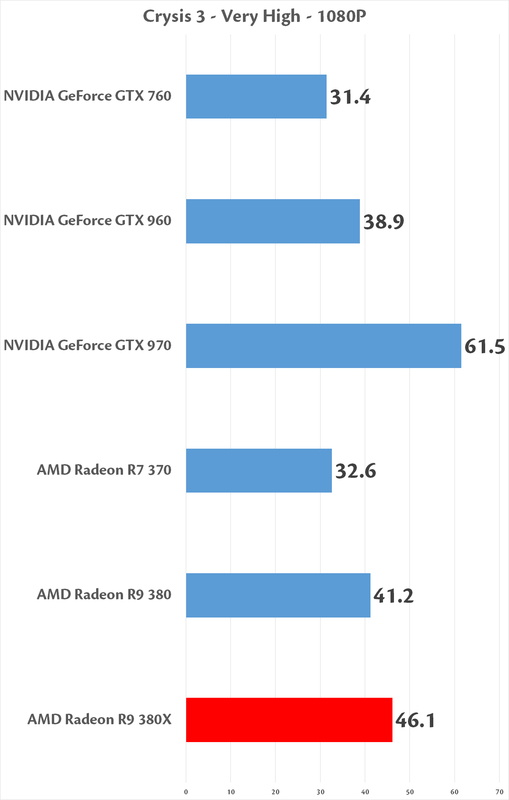 Crysis 3 continues to bring GPU’s to their knees, shaming even highly advanced and efficient chips like GCN and Maxwell. The 970 obviously has no trouble, but being more expensive and with more inherent resources to drive the scene to higher framerates, that’s expected. The 380X does well at both 1440P and 1080P. Well enough to be playable without causing stuttering or issues. It’s a smooth, albeit slow experience. Fallout 4 isn’t exactly the most breakthrough graphical update of an engine, or game series, ever. But it still is challenging to render and makes use of a lot of tessellation, one of the most resource hungry and complex operations a GPU can perform. 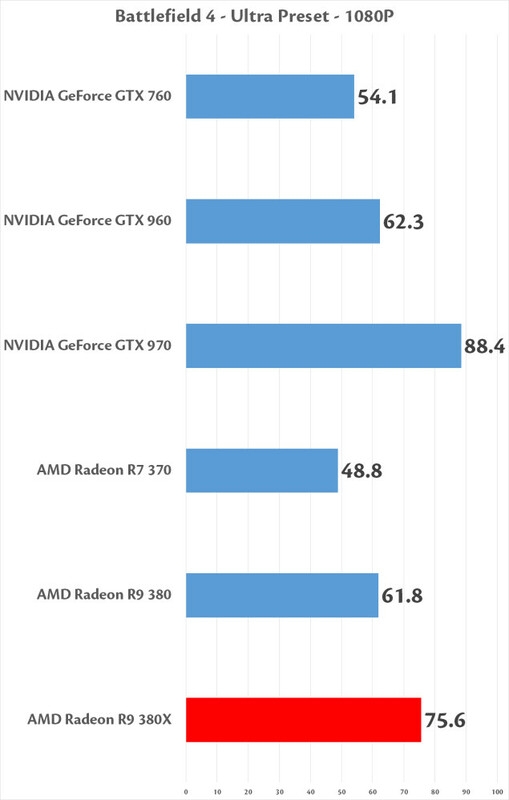 This is certainly faster than the 960 in Fallout 4, even with God Rays turned to High, a GameWorks enabled feature that should theoretically perform better on equivalent GPU’s from NVIDIA. 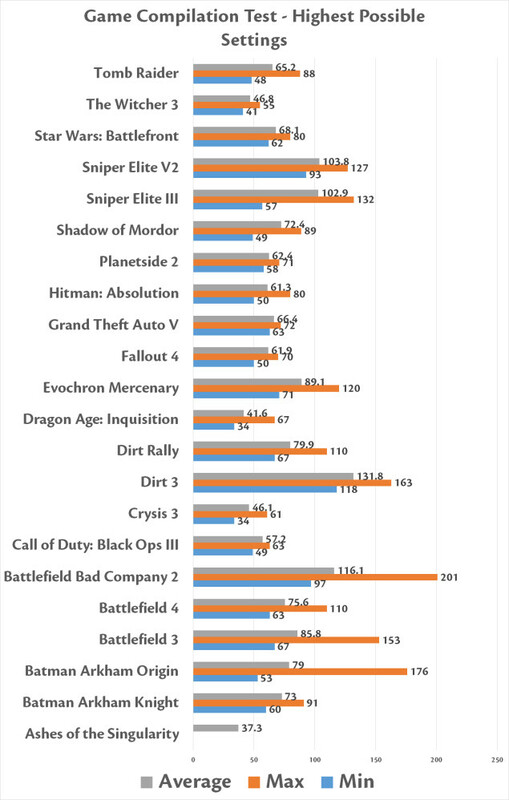 An average of 42.9 is not terrible, and faster than on console and it means a higher resolution. Merely turning down the effects can result in faster performance, so as to make up for the slow-downs that can happen further down the road in Fallout 4. GTA V is a gorgeously rendered game, and very memory intensive at that. It even has a built in memory usage meter so you can see precisely what effects use the most of your precious graphics VRAM. That being said, there are a tremendous amount of options available in game to mess with, and doesn’t have any pre-defined graphical levels. 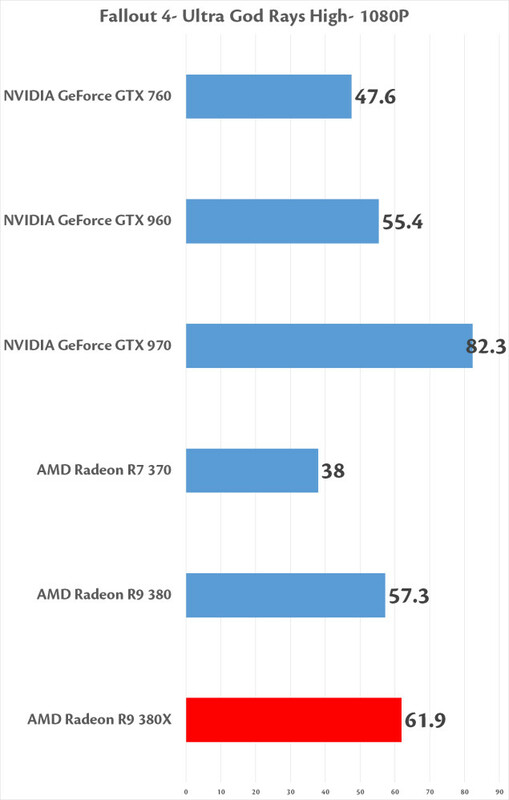 GTA V continues to be punishing, though the 4GB of VRAM and wide 256-bit bus do help to allow for a higher than 60FPS framerate at the maximum settings at 1080P and a very acceptable higher than 30FPS framerate. This is perhaps one of the most demanding games in our test arsenal. It makes use of some very high resolution textures and nearly every effect under the sun that you could possible think of to provide a very emotional and engrossing experience. It’s a fantastic looking game and could very well be the new standard for GPU performance. This was benchmarked using version 1.11, the current version as of October. The Witcher III is still a demanding game with everything turned up to it’s highest settings. On Ultra, the 380 is able to make a good showing at 1080P, but is a bit short of a proper playable experience at 1440P. Turn down the preset to High, and it can be a great experience. More than acceptable. And of course there are always other games that you might play and enjoy, so while we don’t compare these against the competition, the below graph should be able to provide a good representation and idea of what you can expect with a variety of other great games that exist. 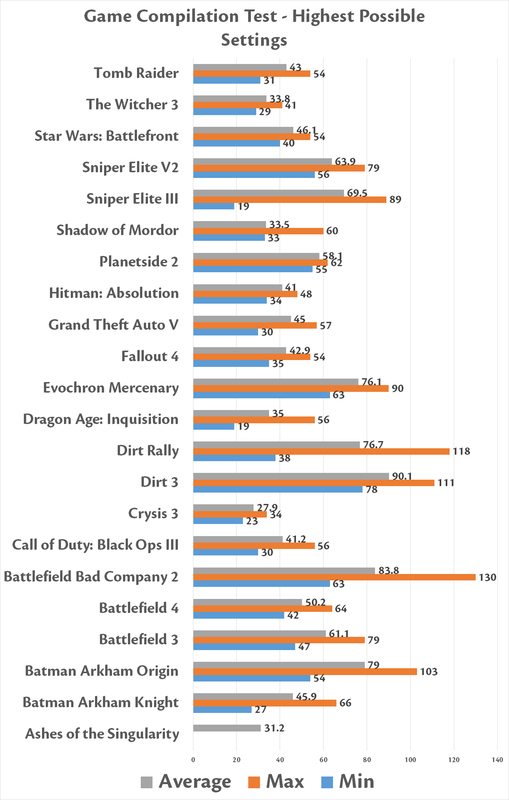 All of the above games were played at the highest possible settings and 1440P. With a variety of games and game engines, the 380X is actually quite the capable card. At 1080P the performance is even better. Minimums in all games represented don’t go below 30FPS at all.